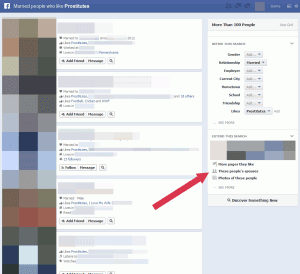 "Facebook Graph search" Is It Good Or Creepy,Girls beware !! Last week Facebook announced it's Graph search and all expected it to legen...dary,but is it really that awesome ?? I was one of the few who registered for the beta version and so i got an opportunity to explore this feature and trust me it's good and bad because it can get really creepy !! When i logged it into in my Facebook account today,I got a notification and I was guided and given a tour of this graph search which I will show you in a sequence in these photos. You will see certain changes like your home buttons are shifted to right and graph search option is on the Left.I think it's time for you change your privacy settings and take matters seriously especially for girls. No doubt Facebook has done an awesome job because it shows quite accurate results and it's algorithm is just right . I will show you certain examples How Good or Bad it Can get !! First when you click on search you will get some customized search options like this as shown in the image. It will automatically retrieve some of the predefined search just as the Google search does and when i click on the "who work in Hackinthus" in the second choice,I get a perfect result. Now let me show you the ugly Part ! What if I search for Married people who like prostitutes.You can see more than 1000 people,wait that's not it now you can narrower your search by selecting different criteria as shown in the next image. Now what if I search for My female friends who are single and you can see a whole lot of options that Facebook has worked out for me.Now isn't that creepy ?? It actually depends on how people use it and for what purpose they are using it for.I will say Facebook has just done an awesome job with this. My personal request to all girls to please got to their privacy setting and make certain changes about what you want to show about yourself and what not . The saying might not be right but it’s hard to look at something like the newly launched Facebook Graph search, and not feel like the whole of your being has been stripped down.